Synthetic aperture imaging is a high-resolution imaging technique employed in radar and sonar applications, which construct a large aperture by constantly transmitting pulses while moving along a scene of interest. In order to avoid azimuth image ambiguities, spatial sampling requirements have to be fulfilled along the aperture trajectory. The latter, however, limits the maximum speed and, therefore, the coverage rate of the imaging system. 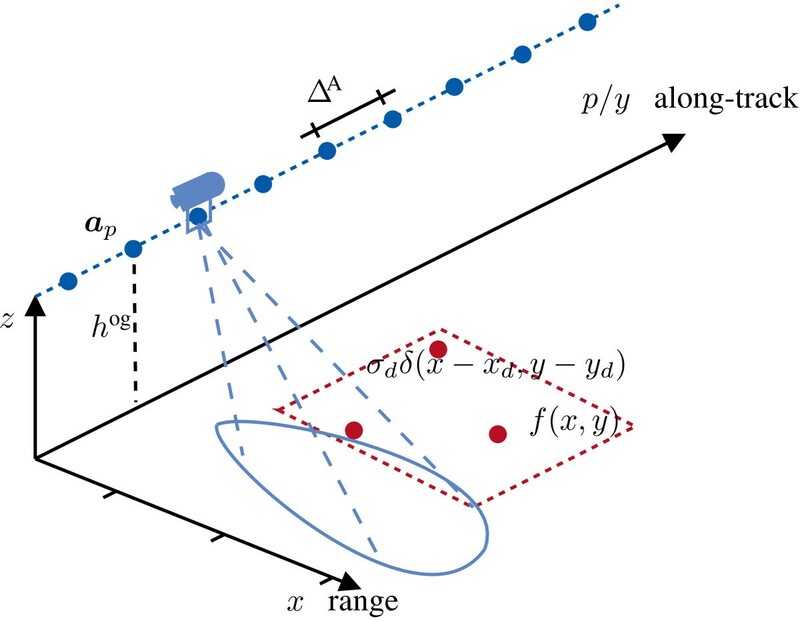 This paper addresses the emerging field of compressive sensing for stripmap synthetic aperture imaging using transceiver as well as single-transmitter and multi-receiver systems so as to overcome the spatial Nyquist criterion. As a consequence, future imaging systems will be able to significantly reduce their mission time due to an increase in coverage rate. We demonstrate the capability of our proposed compressive sensing approach to at least double the maximum sensor speed based on synthetic data and real data examples. Simultaneously, azimuth image ambiguities are successfully suppressed. The real acoustical measurements are obtained by a small-scale ultrasonic synthetic aperture laboratory system. Synthetic aperture imaging[1, 2] is a technique to produce high-resolution reflectivity maps of a scene of interest, e.g., of the earth surface for reconnaissance missions or for glacier monitoring[4, 5] using synthetic aperture radar (SAR). While the resolution is almost identical to optical satellite images, SAR imaging is advantageous due to its weather-independent and daytime-independent deployment. For imaging large areas in underwater applications, the use of optical sensors is inadequate given the attenuation of electromagnetic waves in water. Instead, synthetic aperture sonar (SAS)[7–9] systems are deployed to achieve highly improved coverage rates compared to normal side-scan sonars. In the context of SAS, mine hunting applications are of broad concern[10, 11]. The main synthetic aperture modes encompass spotlight and stripmap operation. While spotlight operation is typically favored over stripmap due to its improved resolution capabilities in SAR, the stripmap mode is commonly used in SAS. The principle of synthetic aperture techniques is to synthesize a large aperture by constantly transmitting pulses (pings) using a single transceiver in SAR or a single-transmitter and multi-receiver configuration in SAS. The physical aperture is mounted to an imaging platform, which travels along a pre-determined rectilinear trajectory passed to the area of interest, the so-called along-track dimension. Given the limited beamwidth of the physical aperture, the synthetic aperture length dynamically adjusts itself proportional to the focusing range. Thus, a constant along-track resolution is ideally maintained for the entire scenery leading to high-resolution images[1, 2, 12]. However, for post-mission image reconstruction, the coherent processing of numerous consecutive echo signals is required, which have to be stored in memory during data collection. Hence, current synthetic aperture systems produce a remarkable amount of data during only a few hours of operation, which leads to issues with respect to data storage, data transportation, and data processing. Additionally, the advance per ping, i.e., the traveling distance of the imaging platform between two consecutive transmission times, is dictated by the spatial sampling theorem[1, 2]. Violation of this requirement leads to the occurrence of azimuth image ambiguities also called grating lobes or ghost targets in the reconstructed image. The latter may mask important image content such as objects or their shadows, which are lost beyond recall. Moreover, the advance per ping influences the coverage rate of the imaging system and hence determines the mission time. Consequently, alternative processing methods are of utmost interest so as to avoid the massive amount of data to be collected and simultaneously to suppress azimuth image ambiguities while reducing the mission time. The emerging field of compressive sensing (CS) introduces a novel sampling framework[14, 15], which is able to lower the sampling rate significantly below the Nyquist rate if the captured signal has a sparse representation in some domain. For example, the image domain itself can be sparse considering a few man-made objects lying on the seafloor. Moreover, an incoherence criterion between the measurement and sparsity domain has to be fulfilled. Roughly speaking, the criterion states that the measurement and sparsity domain have to be highly uncorrelated so that CS can work. Feasible applications cover diverse areas. Among others, the CS framework has been successfully applied in the context of digital imaging, medical scanners, as well as in various radar and radar imaging applications[18–24], which will be briefly discussed subsequently to point out their difference to our proposed approach. In, the need for a matched-filter operation is avoided using CS for focusing the echo signals in range direction and simultaneously reducing the sampling rate. While the use of a specially designed waveform, the Alltop sequence, is suggested in to design a high-resolution radar using CS, the author in chooses a stepped-frequency signal model. Then, CS is applied to reduce the recording time due to the sequential transmission of numerous mono-chromatic signals in the application of radar pulse compression. Similarly, a CS stepped-frequency approach is suggested in in the context of spotlight SAR to decrease the recording time and data storage requirements. Contrarily, the authors in[20–22] use the common linear frequency modulated (LFM) pulse sequence for CS-based SAR imaging using the spotlight mode. Promising results have been achieved using both synthetic data and real radar measurements. In[20, 21], the narrowband as well as the far-field assumption is applied, and thus, range migration[1, 12], which is of major concern in stripmap sonar imaging systems, is not taken into account. Especially, the assumption in of two separate 1-D processing steps is not feasible in near-field scenarios as typically given for SAS systems. The authors of motivate synthetic aperture undersampling in their CS framework to reduce data storage and to obtain wider swath width, again for a spotlight operation mode assuming the tomographic formulation[2, 25]. Interestingly, a randomized transmit scheme is used to lower azimuth ambiguities. To the best of our knowledge, a general description on how to apply CS for stripmap synthetic aperture imaging is not addressed in the literature yet. In this paper, we use the linear system model of the received echo signals as provided in and link it to the CS framework. We demonstrate based on synthetic data as well as on real data measurements that by regularly undersampling the synthetic aperture, CS is capable of successfully suppressing the occurrence of azimuth image ambiguities. This allows that the area coverage rate as a key parameter is improved by increasing the speed of the imaging platform while maintaining the pulse repetition interval. We extend the proposed reconstruction scheme to be used with a single-transmitter and multi-receiver synthetic aperture system as commonly applied in SAS to relax sampling constraints in order to achieve useful coverage rates. The remainder of the paper is organized as follows: Section 2 provides a brief overview of the signal model of stripmap synthetic aperture systems. Additionally, it addresses the vector-matrix notation of the introduced model, the spatial sampling requirements for the synthetic aperture, as well as the single-transmitter and multi-receiver extension. Section 3 outlines the conventional imaging technique and our proposed CS imaging technique. Moreover, we introduce undersampling schemes. Section 4 provides synthetic data results, and Section 5 shows real data results using our ultrasonic laboratory synthetic aperture system. Finally, we discuss the results in Section 6. The principle to form a synthetic array is through transmitting pulses at index times p and receiving the echo signals at each sensor element position a p =[0,p ΔA,hog] T , where hog is the height overground and ΔA denotes the advance per ping of the imaging platform. A typical geometrical setup of a synthetic aperture imaging system operating in stripmap mode is depicted in Figure1, where the direction of wave propagation and the traveling direction of the imaging platform are called range, x, and along-track, y, respectively. A typical geometrical setup of a synthetic aperture imaging system. Geometry of a synthetic aperture system consisting of a transceiver at location a p at ping index time p that records the echo signals scattering back of the target scene f(x,y). e p ( n ) = ∑ d = 1 D σ d · s n - η d , p b ( θ d , p ) + v p ( n ) p = 0 , … , M p - 1 , n = 0 , … , M n - 1 .
b θ d , p = 1 | θ d , p | ≤ θ 0 / 2 0 elsewhere. Here, θ0 is the beamwidth of the physical sensor and θd,p denotes the aspect angle between the d th target and the sensor location a p . Moreover, c denotes the speed of propagation of the wave in the respective medium, e.g., speed of light or sound in water or air, T s is the sampling rate, and s(n) characterizes the transmitted signal pulse form in discrete time. Typical radar and sonar systems use a LFM pulse for s(n) due to its properties w.r.t. range resolution and Doppler shift insensitivity during pulse compression. Phase of the received echo signals and a point target in the scene of interest. Phase of the received echo signals (a) that are recorded along the synthetic aperture resulting from a point target in the scene of interest as shown in (b). (a) Phase response. (b) Single target geometry. where p is the discrete along-track ping index (slow time) of a total number of M p pings, i.e., number of rows, and M n is the number of range bins (fast time), i.e., number of columns. where ⌊·⌋ rounds towards the next smaller integer value. Since a total number of M n fast-time samples is recorded, the vector sd,p must be zero-padded with M ~ η d , p = M n - M η d , p + M s trailing zeros. Please note that the number of fast-time samples M n is related to the maximum range Rmax of the imaging system. Spatially sampling a synthetic aperture is achieved by moving the imaging sensor by a distance ΔA between two consecutive pings as depicted in Figure1. As a consequence, there is a relation between the speed v, the advance per ping of the sensor ΔA, and the time interval between two pings TPRI, which is given by ΔA=v TPRI[1, 12]. Δ max A ≤ D y 4 . Thus, the maximum advance per ping depends on the size of the physical aperture. Violating the condition in (15) yields azimuth image ambiguities, which affect the image quality and may be misinterpreted as real targets. Note that simply increasing the physical aperture D y to enlarge the maximum advance per ping Δ maxA contradicts with the along-track synthetic aperture resolution given by δ y =D y /2. where a p tx and a p rx ( u ) denote the Cartesian coordinates of the transmitter and the u th receiver location, respectively. The objective of synthetic aperture imaging is to focus the received echo signals in range direction and along-track direction to obtain an estimate of the reflectivity of the target area. Typically, image reconstruction techniques can be classified into time-domain and frequency-domain approaches. In this paper, we concentrate on a classical time-domain approach known as time-domain correlation[1, 8, 26]. This technique correlates the echo data with the 2-D signature of the synthetic aperture for each grid point in the target scene. In the following, we provide a description of the time-domain correlation technique in vector-matrix notation and demonstrate that the inversion problem can be solved via CS. G p = s p , 1 , 1 , … , s p , 1 , N y , s p , k , l , … , s p , N x , N y .
to estimate the reflectivity of the target scene f ̂ , where (·) H denotes the Hermitian. Here, f ̂ denotes the stacked target scene, which has to be reshaped to obtain a presentable reconstructed image, i.e., F ̂ = vec - 1 f ̂ . Here, vec-1(·) denotes the reshape operation to obtain a matrix given a stacked vector. While this time-domain approach is not very efficient in terms of computational complexity, it does not use approximations to solve the inverse reconstruction problem; simultaneously, it facilitates the use of arbitrary path deviations. The latter is extremely important for motion compensation techniques such as micronavigation in synthetic aperture sonar[1, 8]. leads to the synthetic aperture image f ̂ . Note that the occurring azimuth image ambiguities in the single receiver images are canceled out during coherent summation. In the following section, we show how CS reconstruction can be performed. which can be solved using, e.g., the SpaRSA algorithm that is directly capable to deal with complex data. Here, Λcs represents the regularization parameter of the optimization problem. Again, the result of the reconstruction is a stacked vector f ̂ cs , which has to be reshaped to obtain a presentable image of the target scene F ̂ cs . As for conventional imaging, the focusing matrix G can by substituted by its single receiver counterpart G u in (25) to obtain the aliased single receiver image f ̂ u cs . Then, a coherent summation of the individual CS images f ̂ u cs , with u=1,…,Nrx, leads to the synthetic aperture image f ̂ cs of a single-transmitter and multi-receiver system, similar to (22). Alternatively, the overall focusing matrix G could be constructed by stacking the individual receiver focusing matrices G u and solving the optimization problem of (25) using the complete data model. On the one hand, this may lead to better imaging results due to a more sparse content of the reconstructed scene. However, on the other hand, this approach increases the computational complexity due to a larger size of the stacked focusing matrix G. Thus, we trade-off computational complexity against imaging performance. where Rmax=0.5 TPRI/c describes the relation between the maximum range and the pulse repetition interval in order to avoid range ambiguities. Hence, an increase in the advance per ping ΔA is either related to an increase in the pulse repetition time TPRI or in the platform speed v. However, a larger TPRI affects the maximum range, which is at the same time limited by the signal-to-noise ratio (SNR). Thus, given a maximum range Rmax of the imaging system, the area coverage rate Acr is solely determined by the speed v.
In the following, we introduce two basic undersampling schemes, namely a regular along-track sampling scheme as well as a regular along-track and random range sampling scheme similar to. Note that CS typically shows the best performance for random downsampling matrices[32, 33]. On the contrary, a purely random sampling in along-track direction without skipping the entire spatial sampling positions would not lead to an improvement in coverage rates but only to a reduced amount of data. The two schemes are illustrated in Figure3. 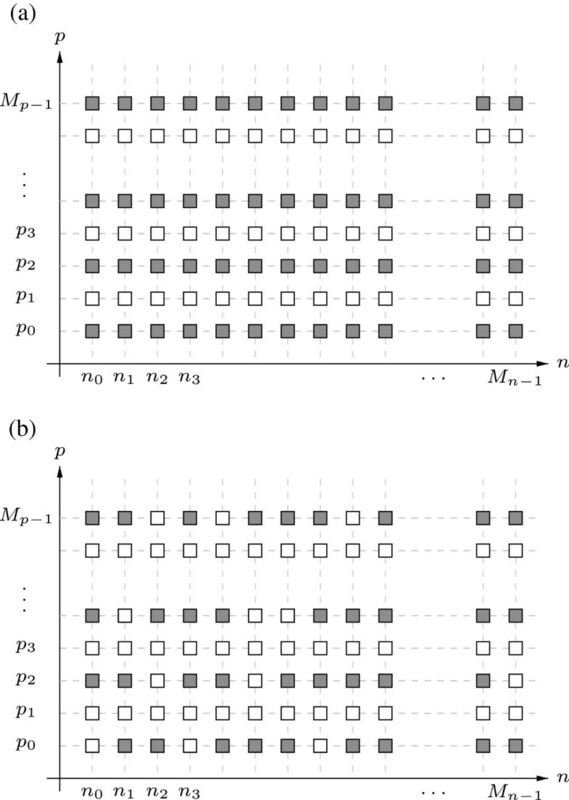 Both subplots show a matrix of slow-time and fast-time samples with gray and white boxes, where the latter means that the corresponding samples have been dropped. In the case of regularly undersampling the synthetic aperture in Figure3a, every second slow-time position a p is dropped, which is denoted by ΔA=2Δ maxA. This means that the actual sampling interval is twice as large as required by the sampling theorem, and therefore, the platform speed can be increased by the same factor. In other words, the selection matrix Σ resembles an identity matrix of size M, where every second row is deleted. Thus, the actual dimension of the selection matrix Σ is given by M ~ × M with M ~ = 0.5 M .
Undersampling schemes. 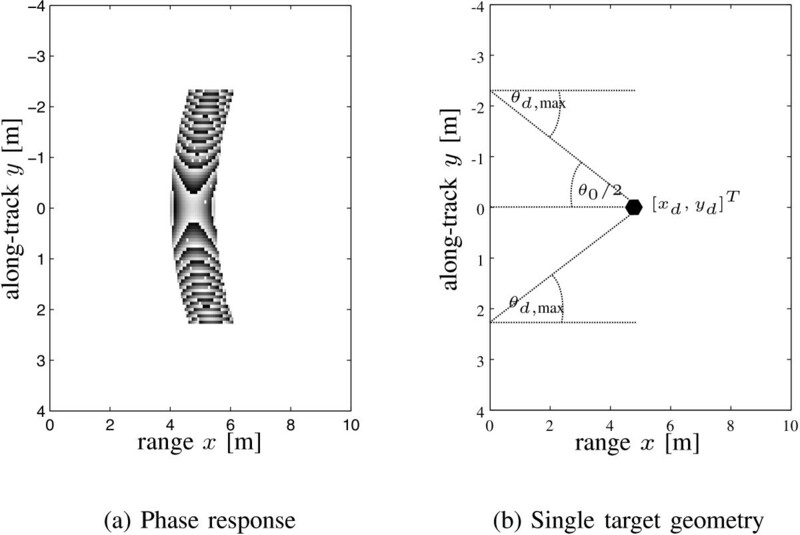 Schemes for spatially undersampling the synthetic aperture in along-track direction (a) and additionally selecting echo samples randomly in range direction (b). (a) Regular in along-track direction. (b) Regular in along-track, random in range direction. Figure3b shows additionally how the range direction is randomly undersampled by dropping fast-time samples with a pre-defined ratio ϱn, e.g., ϱn=0.25 in Figure3b. This scheme is an extension to the undersampling scheme of the along-track direction that additionally leads to storage capacity savings. However, compared to the first scheme, it requires some changes in the hardware of the data acquisition of the imaging system and a different notation for reducing the measurements than by basic matrix multiplication. Instead, we can consider an element-wise reduction operation in (24) depending on the binary value of the undersampling scheme as depicted in Figure3b. Subsequently, we apply the introduced schemes for CS reconstruction on synthetic data examples. This section exemplarily demonstrates the capability of CS to suppress azimuth image ambiguities during the reconstruction of synthetic aperture imagery and, thus, facilitating an increase in the speed of the imaging platform. The reconstructed scenery is based on synthetic data of three homogeneous point scatterers. The system parameters to generate the synthetic echo signals for the following examples are listed in Table1. Note that the system parameters are chosen identical to the ones, which will be used in Section 5 to record the real ultrasound measurements. Therefore, the sampling rate highly oversamples the lowpass echo signals due to digital demodulation. However, the echo signals are downsampled to the Nyquist rate for the outlined processing steps. The corresponding reconstruction results are depicted in Figures4 and5 for the conventional time-domain method and the proposed CS method, respectively, with a dynamic range of 30 dB. In each case, the subplots (a)-(c) illustrate the reconstructed images for an increased spatial undersampling of the synthetic aperture as outlined in the undersampling scheme of Figure3. For the CS reconstruction in Figure5b,c, an additional undersampling drop rate of ϱn=0.7 and ϱn=0.8 is chosen, respectively. Reconstruction results using the conventional time-domain method. Reconstruction results using the conventional time-domain synthetic aperture imaging technique and a regular along-track undersampling scheme with increasing values of the maximum advance per ping in (a-c). (a) Δ A = Δ max A . (b) Δ A = 2 Δ max A . (c) Δ A = 3 Δ max A .
Reconstruction results using the proposed CS method. Reconstruction results using the proposed CS approach for synthetic aperture imaging and a regular along-track and random range undersampling scheme with increasing values of the maximum advance per ping in (a-c). (a) Δ A = Δ max A , ϱn=0. (b) Δ A = 2 Δ max A , ϱn=0.7. (c) Δ A = 3 Δ max A , ϱn=0.8. The occurrence of symmetric azimuth image ambiguities is obvious for Figure4b,c due to the regular undersampling. On the contrary, the CS method is capable to suppress the azimuth ambiguities in all three case. Moreover, there is no notable difference in the quality of the reconstruction of the individual point scatterers although the range undersampling ratio ϱ has been increased. The regularization parameter, which is a trade-off measure between data fidelity and sparsity, has been empirically chosen and set to Λcs=0.3∥(ΣG) H ecs∥ ∞ , where ∥·∥ ∞ denotes the maximum norm. This is similar to the heuristic used in. Note that choosing the regularization parameter is a common problem for sparse reconstruction, e.g., in direction-of-arrival estimation, and still under current research for imaging techniques. Subsequently, we show the extension of the proposed CS imaging technique applied to a synthetic aperture system consisting of a ULA with Nrx=4 receiving elements. The spatial sampling rate ΔULA is set to the Nyquist limit Δ max ULA as stated in (16). The corresponding reconstruction result for correctly sampling the synthetic aperture is depicted in Figure6a. It shows the three point targets as in Figure4a. In contrast to Figure6a, azimuth image ambiguities are noticeable in Figure6b,c. The spatial sampling rate has been set to Δ ULA = 2 Δ max ULA and Δ ULA = 3 Δ max ULA for Figure6b,c, respectively. Next, the proposed CS imaging technique is applied to each receiver element u to obtain a single receiver image f ̂ u cs . The coherent combination of these individual reconstruction results then leads to the images as shown in Figure7a,b,c. While Figure7b with Δ ULA = 2 Δ max ULA shows an identical reconstruction result compared to Figure7a, increasing the undersampling by factor three causes a small spreading of the point spread function of the target at along-track position y=-0.2 m as depicted in Figure7c. However, azimuth image ambiguities are also successfully suppressed for the multi-receiver configuration. Reconstructed images of the conventional imaging technique for a single-transmitter and multi-receiver system. Reconstructed images of the conventional imaging technique for a single-transmitter and multi-receiver system and a regular along-track undersampling scheme with increasing values (a-c) of the maximum advance per ping. (a) Δ ULA = Δ max ULA . (b) Δ ULA = 2 Δ max ULA . (c) Δ ULA = 3 Δ max ULA . Reconstructed images of the proposed CS imaging method for a single-transmitter and multi-receiver system. Reconstructed images of the proposed CS imaging method for a single-transmitter and multi-receiver system and a regular along-track scheme with increasing values (a-c) of the maximum advance per ping. (a) Δ ULA = Δ max ULA . (b) Δ ULA = 2 Δ max ULA . (c) Δ ULA = 3 Δ max ULA . In order to obtain a meaningful assessment of maximum undersampling ratios, for which the proposed CS imaging method still produces nearly identical reconstruction results as for correctly sampling the synthetic aperture, we have conducted NMC=200 Monte Carlo simulations for different sets of undersampling ratios. Each set consists of a factor κ with ΔA=κ Δ maxA and a factor ζ with ϱn=1-1/ζ, where ϱn is the nominal drop rate of fast time samples M n . An average of actual drop rates ϱ ̂ ( κ , ζ ) is depicted in Figure8a, where values with ϱ ̂ ( κ , ζ ) < 0.9 have been clipped. The actual drop rates have been determined by thresholding the magnitude of the raw echo data, converting it to binary values and counting the non-zero values before and after undersampling. Actual drop rates of the simulation results and average simulation outcome of SSIM values. Actual drop rates ϱ ̂ ( κ , ζ ) of the simulation results for CS image reconstruction are shown for different undersampling factors κ and ζ in (a) together with the structural similarity map Ξ(κ,ζ) used as performance measure in (b). (a) Actual drop rates ϱ ̂ ( κ , ζ ) . (b) Structural similarity map Ξ(κ,ζ). where the functions Lu(·), Co(·), and St(·) describe the luminance, contrast, and structure measures between two image matrices, respectively. We refer to for more detailed information. For the SSIM measure, a value Ξ=1 means that both images are identical and Ξ=0 that there is no similarity. However, by assessing a sparse target scene, the homogeneous background influences the SSIM. This effect is reduced by downsizing the area under test to x∈[0.4,1.2] m in range and y∈[-0.6,0.6] m in along-track direction, where the latter boundary is determined by the occurrence of grating lobes in Figure4c. The average simulation outcome of SSIM values Ξ(κ,ζ) for varying undersampling factors, κ and ζ, is illustrated in Figure8b, where values smaller than Ξ(κ,ζ)<0.6 are clipped. Moreover, CS reconstructed images with a SSIM value of Ξ(κ,ζ)<0.7 are affected by undersampling the raw echo data. Consequently, relating the amount of discarded data in Figure8a with the SSIM as a performance measure for successful CS reconstruction in Figure8b, the simulation has shown a data reduction of up to 95%. This section briefly describes the ultrasonic laboratory system used to record the real acoustical data before discussing the CS reconstruction results. The laboratory system is based on a single-transmitter and multi-receiver configuration, which is operated as a stripmap synthetic aperture system using ultrasound. It is similar to the system in. However, due to the non-calibrated array, the system is only employed as a bi-static transmitter/receiver system. Photographs of the laboratory setup are shown in Figure9. The transmitter is the most right element of the imaging platform in Figure9a, which sends LFM pulses with the specified signal parameters of Table1. To the left side of the transmitter, three equally spaced receivers are mounted on the moving platform. Photographs of the laboratory setup. Ultrasonic synthetic aperture laboratory system (a, b) used to record spatially undersampled acoustical data of the target scene (c) in order to verify the proposed CS reconstruction method. (a) Ultrasonic transmitter (right) and three receivers mounted on the imaging platform. (b) Motor, rail, and imaging platform. (c) Real target scenario. Note that the mono-static model as outlined in the previous sections has to be replaced by a transmitter-receiver pair by using (17) instead of (2) with Nrx=1. The platform is moved along a metal rail by a motor with an approximate constant speed v as shown in Figure9b. The received signals are recorded using a National Instruments (NI) data acquisition card and are processed by a PC using MATLAB. The same system parameters as in Table1 are used for the laboratory system. Furthermore, a speed of v=0.05 m/s and a pulse repetition time of TPRI=0.12 s are set to meet the spatial sampling requirements as discussed in Section 2.2. The high oversampling rate is used due to discrete-time demodulation of the received echo signals. However, the discrete-time signals are then downsampled to meet the temporal Nyquist rate of the transmitted pulse. 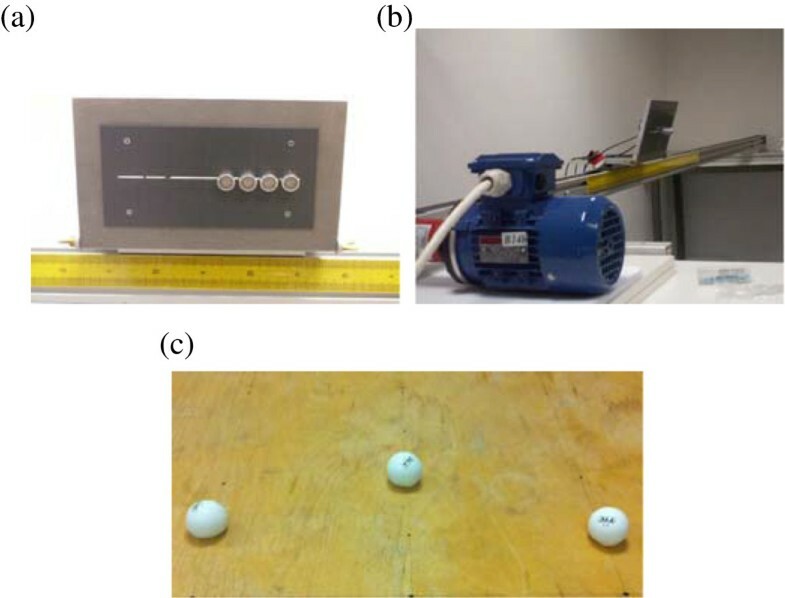 The imaging scene (Figure9c) consists of three ping-pong balls similarly placed as the point targets of the synthetic data examples. Subsequently, we apply both imaging methods to the experimental acoustical data. In case of aperture undersampling, the platform speed is increased to v=0.1 m/s as well as v=0.15 m/s, which is equivalent to an undersampling factor of 2 and 3. The regular along-track undersampling scheme is used as depicted in Figure3a and the CS regularization parameter is set as for the synthetic data examples. The corresponding reconstruction results are depicted in Figures10 and11 for the conventional and CS-based imaging method, respectively. The dynamic range of all images is 30 dB. In Figure10a, a clean image reconstruction of the three ping-pong balls can be seen. Note that the along-track resolution is better than the range resolution due to the relatively small bandwidth of the ultrasound sensors. Increasing the platform speed, however, yields again azimuth ambiguities for the conventional imaging method that are of varying strength on both sides of the true target location. This is related to a non-straight alignment of the ultrasound sensors used in the laboratory system. Moreover, the non-calibrated sensors currently hinder the use of the entire array as a single-transmitter and multi-receiver system. Reconstruction results of ultrasonic laboratory data using the conventional imaging method. Reconstruction results using real acoustical measurements and the conventional imaging technique as well as the regular along-track scheme with increasing values (a-c) of the platform speed. (a) Δ A = Δ max A , v=0.05 m/s. (b) Δ A = 2 Δ max A , v=0.1 m/s. (c) Δ A = 3 Δ max A , v=0.15 m/s. Reconstruction results of ultrasonic laboratory data using the proposed CS method. Reconstruction results using real acoustical measurements and the proposed CS imaging technique as well as the regular along-track scheme with increasing values (a-c) of the platform speed. (a) Δ A = Δ max A , v=0.05 m/s. (b) Δ A = 2 Δ max A , v=0.1 m/s. (c) Δ A = 3 Δ max A , v=0.15 m/s. Considering the reconstruction results using the proposed CS method, it becomes apparent that the azimuth image ambiguities can be successfully suppressed for the real data measurements and that the images show almost an identical quality (compare Figure11a with Figure11b). Hence, the platform speed can be doubled without any loss in image quality. For a higher speed (v=0.15 m/s), the CS reconstruction result starts to suffer from ambiguities. Also note that we have chosen a target scenario with closely spaced targets to keep the target strength variability small. Otherwise, the weaker targets might be suppressed by enforcing the sparsity of the scene. Moreover, the undersampling ratio is significantly smaller than for the synthetic data results but still twice as large as for proper Nyquist sampling. In this paper, we have proposed a CS imaging technique for synthetic aperture systems operating in stripmap mode either using a transceiver or a single-transmitter and multi-receiver system to synthesize the aperture. The technique is based on the conventional time-domain correlation method. We have demonstrated its capability to suppress azimuth image ambiguities for synthetic data as well as for real acoustical measurements. Especially for synthetic data, a large data reduction has been achieved given the perfect match between the data model and the CS reconstruction model. On the contrary, significantly less undersampling has been feasible for the laboratory system most likely due to model mismatches between our target scene and the assumption of point targets. Nevertheless, we have been able to double the speed of the imaging platform while maintaining the image quality. Currently, we are still facing open challenges that have to be solved before CS can be employed in a real non-laboratory system. In particular, this involves handling of target scenes consisting of heterogeneous target reflectivities as well as extended targets rather than point targets. While heterogenous target scenes may be addressed by an improved echo data modeling, the challenge of extended targets may be handled by choosing a different sparsity transform. Additionally, the echo data model should be adapted to mitigate the stop-and-hop assumption. Moreover, an automatic procedure for selecting the regularization parameter is necessary, and finally, a jittered pulsing scheme could be applied to randomize the undersampling in order to weaken the amplitude of azimuth image ambiguities. This research work is part of a collaboration with ATLAS ELEKTRONIK GmbH in Bremen, Germany. The authors would like to thank Dr. J. Groen from ATLAS ELEKTRONIK GmbH for his valuable feedback on the paper and M. Leigsnering for all the fruitful discussions.